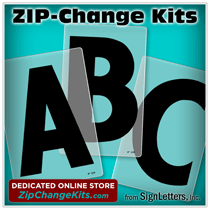 In most cases, Cast Aluminum Letters offer greater dimension than would a flat-cut aluminum letter which means your sign letters will have more of a dimensional appearance. Cast metal letters can be very economical and are commonly used as exterior building signage when a touch of class or a sense of permanance is desired. You can select cast aluminum lettering in any of the many great looking finishes we have available (see below). 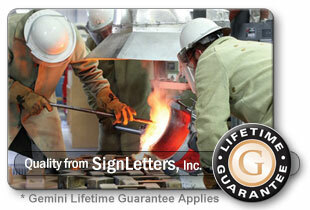 We offer Cast Aluminum Letters (Alloy #514) with stroke sanded faces and bead blasted returns. Once your aluminum letters are cast from prime ingot, sanded, blasted, and inspected, the aluminum letters are then finished in one of several methods to provide high-quality, beautiful and professional sign lettering. FYI - Satin aluminum (sometimes called brushed aluminum) is the most common cast aluminum letter finish and it will cost the least of any cast aluminum letters while also providing quick production times.